Kasargod, June 9,2016 : The family of a man said to be a Saudi national who was admitted to the Snehalaya Rehabilitation Centre at Manjeshwar Pavoor after he underwent nearly 2 years of imprisonment in Kasargod for not possessing any relevant document, is still untraceable. The man who identifies himself as Abdul Basheer (32) was first taken into custody by the Kasargod police in September 2012 after he was lurking suspiciously in the town. He was later sentenced to two years of imprisonment and an additional one month of imprisonment as he could not pay the fine amount. He was subsequently admitted to the Calicut Mental Hospital where he underwent treatment for one year from April 24. Though he had stated that his father’s name was Sayyed Hussain Makkanakkas Arhatul Uloom, intimation of the same to officials of Saudi Embassy did not yield any result as his family could not be located. Ultimately the DC ordered that he be shifted to Snehalaya where he is still staying. Sources said Basheer who worked in a Saudi mosque had entered Kolkata along with some migrant workers and had later moved to Hyderabad. 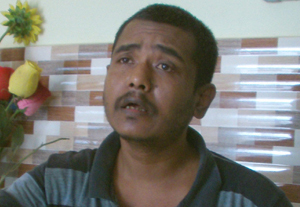 He was arrested when he was in Kasargod. It is said his father is of Pak origin and mother a Burmese.